Don’t blame social media and Millenials for your lack of success on social. If you feel social media makes you unhappy or your brand isn’t getting anywhere, then you’re doing it all wrong. Let’s fix that. Today, I will show you how you can apply only one principle Marie Kondo uses to declutter houses to KonMarie your social media and make it a place that ‘sparks joy’. One rule but three practical tips to better your presence no matter which social platform you are focusing on. ‘KonMarie’ is a trademark of Marie Kondo, an organising guru. She has published a book about the art of organising and decluttering your home, but it was the Netflix show that brought her to fame. As you can see from our chart the internet has gone KonMarie crazy after the release of the series – data will always tell you the truth. To ‘KonMarie something’ has become a catchphrase. It means that you are removing the clutter from a particular area of your life. But I think you can apply the same principles to your work on social platforms. As a Digital Communication Expert, I find brands often struggle to build a highly engaging audience. Engaged crowd lets you learn more about their needs and desires giving you a chance to better position your business. Those active followers are more likely to buy your products and services. Since KonMarie phrase became so popular, I used it to teach brands how to find a voice on social media. Let me show you how you can apply it to your online presence to make an instant impact and grow organically improving your ROI. If you want to see the change, start with yourself. ‘KonMarie’ method of organising tells you to keep only items that spark joy, but when we are talking about social media don’t forget that you are also an ‘item’ in your customers feed. Do you spark joy? Before you publish your next blog post or schedule your next Instagram post, ask yourself: Dos it sparks joy to me? Will it spark joy to my customers? A simple, yet profound question. You might decide against publishing some of your content when you answer it from the bottom of your heart, and that’s okay. Ask, is this the best content I can produce with the resources I have? Maybe you rushed it through, so the value for your consumer isn’t there? Choose wisely the accounts you follow. Curate your feed so it ‘sparks joy’ when you scroll through it. I urge you to choose those who are better than you but never compare yourself to them, use their awesomeness as a driving force to better yourself. Get inspired and learn from the best. In a nutshell, follow all the accounts that can challenge your thinking. Engage with those who encourage you to become more creative with your content. Let into your social media world those creators who ‘spark joy’ and put a smile on your face. The success of any social media lies in three ‘C’. Make connection and practice communication. Plan time to interact with your followers and those who influence you. Leave comments which ‘spark joy’. Use Marie Kondo mantra and become the little ray of light and brighten someone’s day. You will grow a community that will grow your business quicker by leaving two or three comments that ‘KonMarie’ would be proud of rather than twenty comments which consist of emoji. Marie Kondo success is easy to explain; the ‘KonMarie’ philosophy is simple to learn and comprehend and I believe that if you take the same approach to your online presence, you will be successful. What authenticity has in common with ‘sparking joy’? The principle of ‘sparking joy’ when engaging on social channels isn’t rocket science. Social media success comes to those who are authentic. We all know what it means, but at times we find it difficult to comprehend how to put it into practice. When I run workshops or work with my clients I always advise to think and ask yourself; What do you want your audience to think and feel when you post a blog/image/tweet? It helps to figure out what impact you want to make. 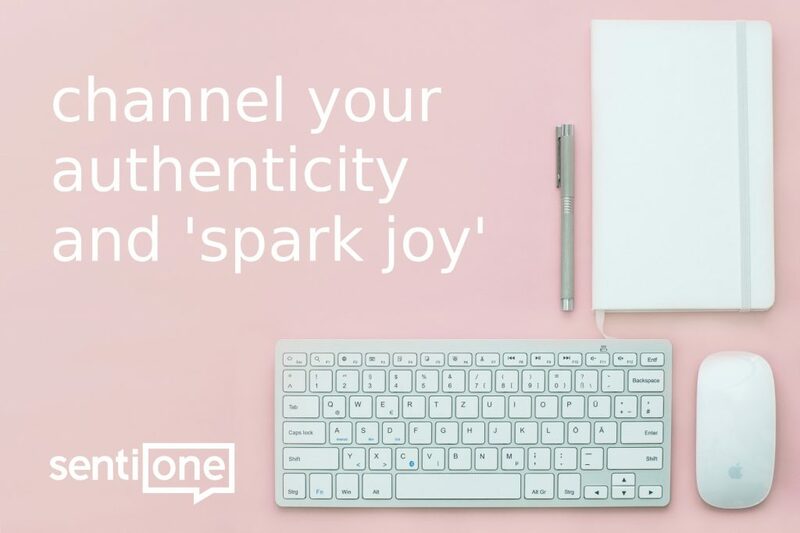 Content, communication or interaction which ‘sparks joy’ as Marie Kondo says, it all about finding what it is that matter to you and how you want to talk about it to attract a like-minded crowd. Now, go and plan your content for the month ensuring that it will spark joy. Next, build around you an inspirational community. Finally, use social for what it is supposed to be, a social party that has no borders. Connect, communicate and create a community by bringing joy. I challenge you to channel your authenticity and ‘spark joy’. Try leaving at least one meaningful comment every day for a month on your chosen social media platform and watch the magic happen. Then come back and tell me what amazing things have happened over that month. SentiOne – on the road to perfection!